The Walt Disney Company has announced that the D23 Expo Japan 2015 is scheduled for November 6-8 at the Tokyo Disney Resort. 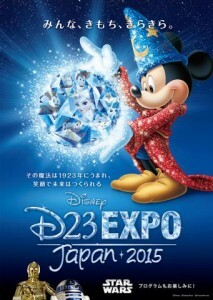 The Expo debuted in Japan in 2013 to much fanfare. This year’s Expo will focus on the “power of the story” and will bring together the worlds of Disney, Pixar, Star Wars, and Marvel. Events include panels, presentations, and exhibits. The Walt Disney Archives will have a special exhibit focusing on Disney Princesses. The exhibit will include costumes, artwork, vintage collectibles, and film props. Prior to the D23 Expo Japan, the D23 Expo: The Ultimate Disney Fan Event returns to the Anaheim Convention Center on August 14-16.